Sometimes a shape evokes a thought or feeling: Hearts for love. Circles for life. Angels for protection. Stars for honor. Our pewter ornaments have more uses than just holiday decorations. They are special shapes and special materials to carry your inscription. 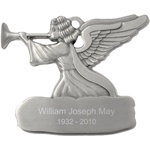 Begin a new tradition or memorialize a person or event. Hang them in a window, on a wall or door, or display them on a shelf. 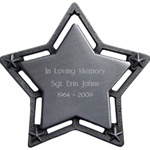 Engravable Pewter Star Ornament. 4 small raised stars, & Cutout star to hold cord. A star within a star! Large front engravable area. Solid pewter. 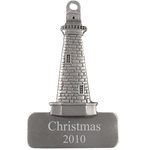 3" x 3"
Anyone who loves the water, loves sailing, or has a wistful spirit will love our engravable 3 inch tall solid-pewter lighthouse. The raised details show the stonework, 2 windows, railings, and tiny roof! It's personalized on the lighthouse's beveled foundation that is made to look like granite or concrete. Engrave it with a name or date! Display it all year round! ITEM #EP011 Snowcouple cuddled up tight! Raised carrot noses, puffy cheeks, closed eyes, and contented smiles. GREAT details - you can count the eyelashes! Sweet with a generous engravable area. What's YOUR good news? Sweet angel leading the way! Raised details. Engravable cloud. Solid Pewter. ITEM #EP04 Our Jack-in-the-Box has popped up with the cutest smile! Adorable raised details. 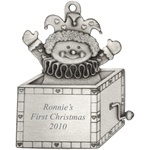 The generous engraving space can hold names, dates, maybe a short message, and this adorable pewter ornament is suitable for Christmas or anytime. 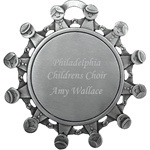 ITEM #EP10 Engravable flat solid-pewter circle surrounded by children holding hands. Raised Details. A true message of unity. Engrave on front.